Chris began his career in Risk Advice after securing a Management/Para-planning role with a well-established Risk Advice practice in 2012. 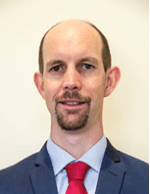 He was mentored by the Senior Planner and after a short time was encouraged to gain the relevant qualifications to move into an advisory role.Chris completed a Diploma of Financial Planning, obtained RG146 qualification and began providing Risk Insurance Advice in 2013. He continues to build his knowledge through regular professional development and ongoing training. Chris received recognition by way of a Certificate of Excellence in 2015 for his commitment to providing outstanding advice after achieving the highest Advice Quality Rating possible. He was also nominated for the 2015 Rising Star of the Year Award by his Financial Services Licensee. Chris prides himself on being very thorough in his process and going the extra lengths to achieve appropriate outcomes for all of his clients.